Even if you only fly first class, there’s no getting around the fact that moving your bowels at 36,000 feet is a bit of an ordeal. Airplane lavatories are cramped, turbulence can unseat you, and the line of people waiting just outside the flimsy door can make it difficult to relax. Despite these drawbacks, airplane lavatories used to be much, much worse. Take a look at 10 facts we’ve uncovered about the past, present, and future of turds on the tarmac. 1. PASSENGERS USED TO CRAP IN BOXES. No matter how boorish your seatmate might be or how loud the wail of the child behind you, be thankful you weren’t one of the earliest pilots or passengers during the aviation explosion of the 1930s and 1940s. Without tanks or separate bathroom compartments, anyone in flight would have make do with pooping in buckets or boxes that would sometimes overflow due to turbulence, splattering poop on the interior; some pilots peed into their shoes or through a hole in the cockpit floor. The first removable bowls were seen at the end of the 1930s, with crew members having to come and empty them out after landing. Removable tanks followed in the 1940s. 2. THE BRITISH POOPED RIGHT INTO THE SKY. In 1937, a “flying boat” dubbed the Supermarine Stranraer was put into service by Britain’s Royal Air Force. It didn’t take long for the craft to earn a nickname, the “whistling sh-t House,” owing to one curious design choice: The toilet onboard had no tank or reservoir and opened up to the sky below. If the lid remained open, the passing air would prompt the plane to make a whistling noise. 3. CHARLES LINDBERGH PEED ON FRANCE. Famous aviator Charles Lindbergh completed his transatlantic flight from New York to Paris in 1927 and met with King George V shortly after touching down. The 33-hour flight led him to ask Lindbergh how he had managed his bodily demands during that time; Lindbergh replied that he had peed into an aluminum container and then dropped it while flying over France. 4. FALLING FROZEN POOP WAS A BIG PROBLEM IN THE ‘80S. As aviation become more sophisticated, toilets went from merely trying to contain poop to actively trying to fight germs with Anotec, the brand name for the “blue liquid” found in freestanding bowls. Unfortunately, the tanks housing the liquid and the waste were sometimes prone to leakage in the air, prompting giant biohazards to freeze on the hull of planes and then break away as the aircraft began its descent. The apocalyptic poop balls reportedly smashed cars and roofs before Boeing and other manufacturers adopted the vacuum system still in use today. 5. THERE'S BEEN ONE CASE OF CATASTROPHIC GENITAL INJURY. 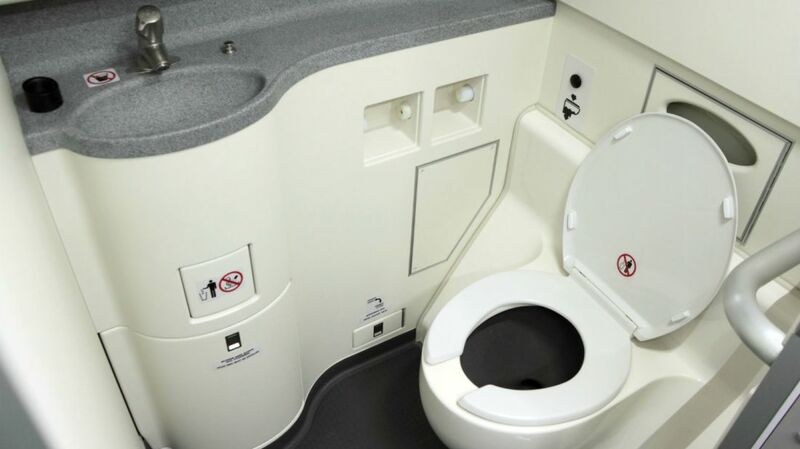 The current pneumatic vacuum system toilets use pressure to siphon waste from the bowl without using much liquid, which keeps the plane from having to carry the additional weight of waste water in the sky. The noise of the violent suction can be unsettling, but it’s rare you’d actually be in any danger. Rare, but not impossible. An article in the Journal of Travel Medicine in July 2006 [PDF] reported one case of misadventure due to an airplane toilet. A 37-year-old woman flushed while still seated and created a seal, trapping her on the commode. After being freed by flight attendants, she was examined by doctors and was found to have a labial laceration that resulted in “substantial” blood loss. She was treated and recovered fully. 6. THERE’S A TRICK TO AVOID STINKING UP THE PLANE. No one wants to be the person who exits a lavatory having polluted the pressurized cabin with a foul odor. According to an ex-flight attendant named Erika Roth, asking an employee for a bag of coffee grounds and then hanging them in the bathroom can help absorb any odors produced by your activities. 7. AIRBUS TOILETS CAN REACH POOP SPEEDS OF 130 MPH. Dubbed the “Formula 1” of airplane toilets, certain Airbus models circa 2007 could produce unbelievable suctioning power. In a demonstration for a journalist (above), their A380 model could move sewage at speeds of 130 miles per hour. The speeds are necessary when bathroom waste needs to travel the length of the passenger cabin to the sewage tanks in the back. Already short on space, airplane lavatories might become even more cramped in the future. A 2017 report by Condé Nast Traveler indicated that as older planes are taken out of service, newer-model passenger planes are coming in with modified bathrooms that are up to two inches smaller in width and depth. Industry observers believe the shrinking bathrooms could pose problems for people with disabilities, pregnant women, and those who need to accompany their child into the bathroom. 9. BOEING MIGHT HAVE PERFECTED THE AIRPLANE POOP EXPERIENCE. In 2016, the aeronautics company announced a possible solution to the germ-infested poop closets found on planes. Their self-cleaning lavatory uses ultraviolet light to kill 99.9 percent of all surface bacteria. The light would be activated between occupancies to sanitize the space for travelers. Boeing also envisions this lavatory of the future to be touchless, with a self-activating seat and sink. 10. THERE’S A REASON THEY STILL HAVE ASHTRAYS. Ever wonder why airplane bathrooms have ashtrays built into the wall or door even though smoking is banned on virtually all flights? Because federal regulations still require them. The thinking is that someone sneaking a smoke will still need a place to put it out, and the risk of fire is reduced if they have a proper receptacle.